There’s no shortage of scareable moments in the morgue. I was unlucky enough to experience one during a recent shift. Our machine was under repair and we had to use the portable for cases. Once positioned, I am too short to reach the controls on the x-ray tube. A smart x-ray tech would set the technique before positioning the tube, but let’s see how logical you are at 5 am. As a side note, I should mention my PPE. PPE stands for personal protective equipment and is necessary when working with dead bodies. It includes a gown, two sets of gloves (I like to double up), a cap, a mask, and booties. The booties are important, I promise. After standing on the tip of my toes and reaching, I decided to stop being lazy and get the foot stool. Conveniently, the stool is located in a separate room: the decomp room. The decomp room is a special room where the stinkiest of cases go. Fortunately, on that morning, no one was in there. I opened the door and took in the creepiness of the room. It was dark and too quiet. I turned on one of the lights and began to walk across the room to where the foot stool was located. As I did, I heard, “psst”. Frozen in my tracks, I listened carefully for another “psst”. I looked around the room and checked for life. There’s a bathroom in here, and many of the techs use it when they don’t want to go into the locker room. The bathroom was empty. So I looked behind me to see if someone had poked their head in after me. The door was still closed. I decided that the smartest thing to do is not stand frozen in the middle of the room so I grabbed the stool and ran. You know that feeling you have when you run up the basement stairs not looking behind you out of fear that you might actually see something? Multiply that by five and that’s how I felt as I ran out of the room. Safely back in the x-ray room, I laughed at myself for being as afraid as I was. I told my partner how creeped out I was and sufficiently creeped her out with my story. Terror, much like misery, loves company. But I’m a skeptic. Weird things happen around here all the time, and I’m usually the first one to find the rational explanation to ease nerves. Regardless, this silly event had me rattled. No one was in the room. As far as I know, there isn’t a speaker in there so it’s not like someone could have said it over an intercom. Could it have been outside the room? I ran through all of the possible explanations and came up with nothing. So with a deep sigh I hung my head in shame and looked down at my feet. Booties. 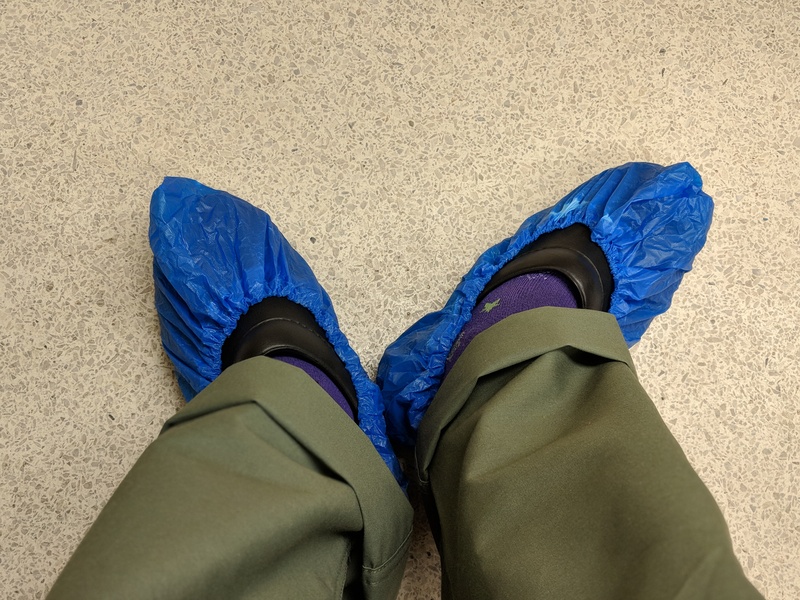 The PPE booties we wear are made of plastic. As you walk, they make a not-annoying-at-all noise. A noise that’s loud enough to hear down at the other end of the hallway. The “psst” I heard was actually the “swish-swish” of my own feet. Boom. Rationalized. Eerie feeling gone. I am an idiot. My partner wasn’t as quick to accept my completely rational, totally logical founded-in-science explanation. So I walked around the x-ray room rubbing my feet together (swish-swish) while saying “psst psst,” in an effort to prove my theory. She still doesn’t believe me. Are you sure it was your booties…?? I would have been freaked out as well. Guess you inherited your bravery from me.